I feel a little bad, because I didn’t actually think that my departure from La Puerta would usher in the floods, but that is kind of what is happening. 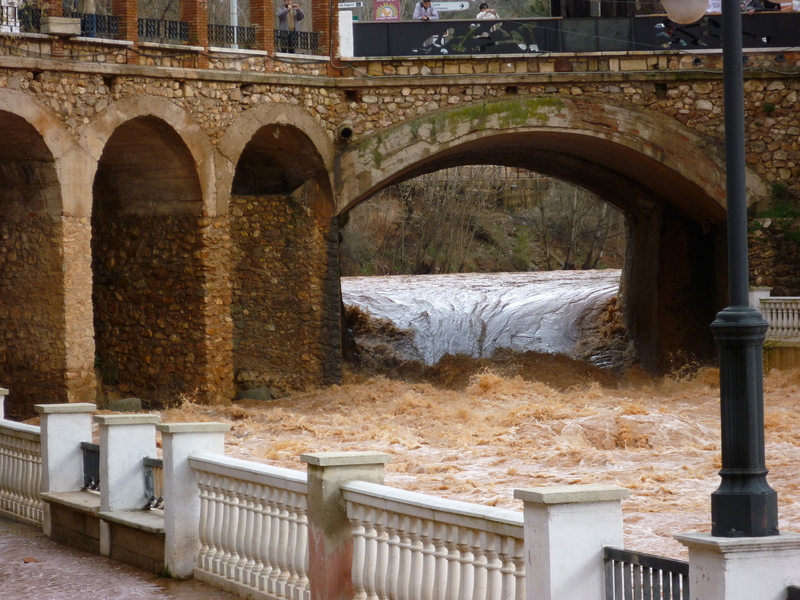 La Puerta hasn’t really flooded, but LOTS of other towns have, and the river was absolutely raging all week long, lapping up over its concrete banks and depositing mountains of unbelievably orange muck all over the place. When I arrived for the last time in La Puerta on Monday, my roommate greeted me by telling me that the river was about to overflow and that our upstairs had just contacted the police to find out what the evacuation plan was. 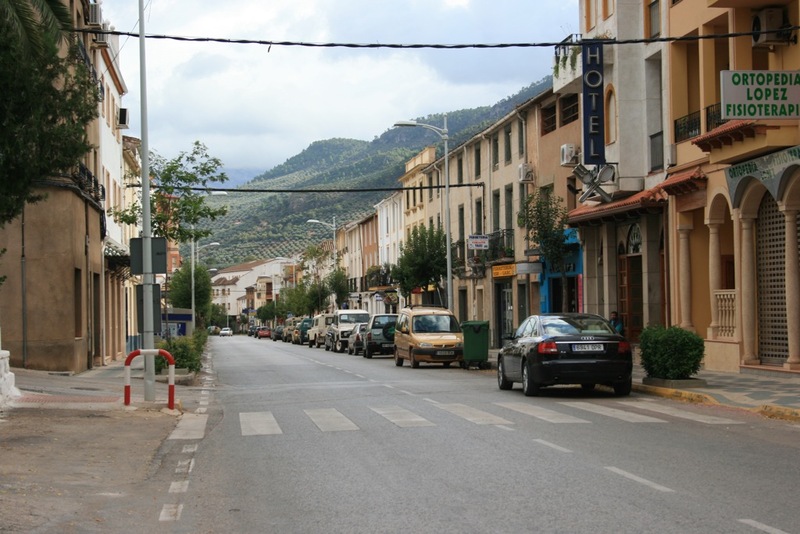 The guardia civil told her that if the river overflowed that night, they would drive a fire truck down into the affected streets and blast the sirens to wake everyone up. My roommate moved her car up the hill out of harm’s way and we made plans with aforementioned upstairs neighbor to come up and stay with her if the water started rising. This was especially scary since we live in a ground-floor apartment three houses from the river. Our one window is about two feet off the floor and has sturdy iron bars over it. Our front door locks from the inside with a key, and can only be unlocked with a key. I made sure to keep the keys in the door that night. In the morning I woke up alive. I packed up my backpack and left in on the bed just in case the water came up while we were at school. Then I learned we would be having a pizza party! In my honor! That night! I was thrilled because I had heard all about this pizza place which I guess is one of the only places worth going in La Puerta. Sadly, that night at the exact minute that the hot water AND power went out, my roommate got a call saying that the dinner had been postponed. Evidently someone’s roommate’s father had passed away (or at least that is what I had heard), and everyone decided it was better to postpone the dinner for one night. I had no problem with that, and some of the other teachers decided to go out for coffee. We had a late coffee and headed on our way…..somewhere. I didn’t really know where we were going, but I figured we would get there soon enough and it wasn’t worth me admitting that I hadn’t completely understood what was going on. I thought maybe another bar or cafe? It seemed weird to have food or drinks after coffee, but we had gone out pretty late, so maybe it was just a crazy day. We walked to an older part of the town that I had only walked through (it was the part with the kid with the bb gun and the creepy drooling man, so I have chosen to stay away). Anyways, I actually said “I’ve never been here before!” thinking we were going into a bar. We went inside the door and there was a casket sitting in the living room of what I at once realized was a Spanish house, filled with mourners. Totally shocked, I quickly figured out what was going on. I had heard that someone’s roommate’s father had died, but it was really one of our coworkers. Compañero and compañero de piso kinda sound the same when you’re not paying attention. Well, the man who had passed away was 91 and while it wasn’t completely unexpected, it was still really, really sad. The son (my coworker), who is probably 60, had clearly been crying, as had his sister, and his aged mother, wrapped in a thick plaid blanket and sitting in a reclined wheelchair next to the casket of her husband, was still weeping. I realized we had to go around and offer our condolences to the family, so I did. Two kisses for everyone, and a few nice words. I felt really weird because the family had NO IDEA who I was, and frankly I don’t know why my coworkers brought me there. Then, as we sat under the brasero by the door and the entire town slowly trickled in, I realized that in a town this small, no one’s not invited to something like this. Especially when the person being honored had lived in the town for 91 years. It was about that time that the power went completely out and the entire house was plunged into complete and total darkness. People slowly started getting out their cell phones until a mismatched collection of religious candles could be found to light the place. It was still pouring outside and we were literally right on the river, so you could hear it roaring by outside. We stayed for about two hours, and then headed home. It was honestly one of the weirdest things I’ve experienced yet in La Puerta, and something I don’t think I’ll ever see again. So that experience felt like something out of an unfunny episode of Curb Your Enthusiasm for me since I thought we were going to the bar until the moment I saw the casket. 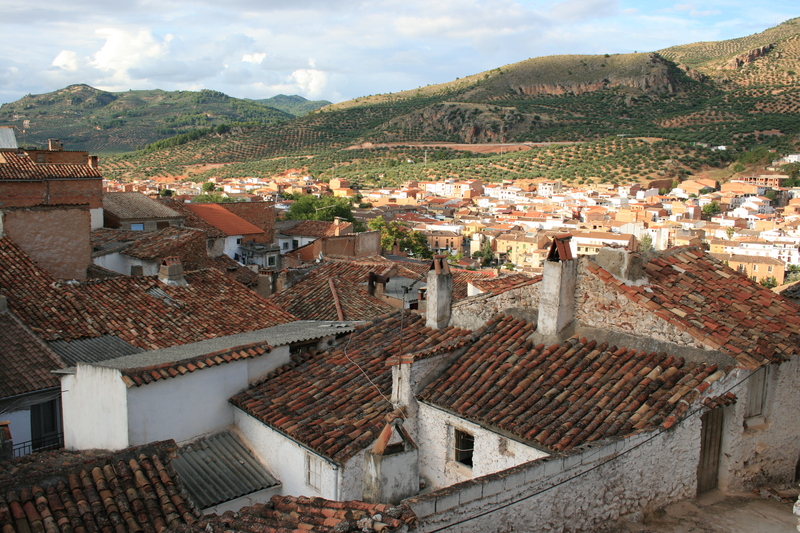 The rest of the week proceeded with less excitement; the pizza party turned into a night of tapas, too many drinks, and some impromptu salsa dancing, and after a few tearful goodbyes and many, many kisses from my adorable students, I was back on the bus to Baeza. After a nauseating two hours, I got off, in the rain, excited to walk the 15 minutes home even with my bulging backpack and plastic bag stuffed with random bottles of spices and vinegar. It was raining, but I was just excited to be done! Then I fell. I fell hard. I haven’t fallen in at least a couple years, and I feel like I got what was coming to me since I think every human HAS to fall every once and a while. I was long overdue for mine, and I paid the price. I guess I was lazy, or tired, or stupid, but whatever it was, after successfully crossing a treacherous parking lot filled with mud and huge puddles and rocks and dog poo, I couldn’t quite get my foot all the way over the curb of the first sidewalk. I ripped my (new!) jeans, cut open my knee, cut open my hand, and my bottle of foodstuffs went flying. Driven by shame and adrenaline, I immediately got up and walked home, covered in mud, blood, and tears. That was the end of my last day in La Puerta, which seems appropriate enough. My knee is now swollen and scabbed up like a seven year old’s might be after a tumble on the blacktop and my pride is equally wounded. At least I can rest assured that, at least for a while, I won’t be due for another big fall. And now, it’s time to pack. I have been procrastinating at one of my favorite Baeza institutions, La Nájera. They have free wifi and awesome tapas and sandwiches, and the best waiter I have ever had in my life. He sounds like a chain-smoking bullfrog and has a shiny bald head. He is awesome. I’ll actually miss this place, but as of 8am tomorrow, out of here! Wish me a safe journey!! Closed Mondays for “Personal Rest.” Typical! Oh my god. I am terrified right now. To give you an idea of what is going on in celebration of the town’s patron saint, please watch this video. This would be fun if there were people around, but all the teachers have abandoned the town so I am alone! Since this is way too weird and scary of a thing to do on my own and since all the teachers advised it, I am going home to Baeza for the night. I’ll return tomorrow at the height of the madness, with fingers crossed that I don’t get incinerated. So yesterday when I was walking to work at 8am, I passed some of the usual characters: dirty old men hanging out at the auto repair shop, migrant workers hanging out at the bus station, more old men (less dirty), hanging out at the bar/cafe, some stray dogs, etc. The auto repair shop and the stray dogs were actually passed multiple times, because the entire town of La Puerta seems to be composed mainly of auto mechanics, their dirty friends, and their stray dogs. Anywhere you go in town, you are within spitting distance of that assortment of creatures. Not the bucolic ideal I was hoping for, but whatever. Anyways, after passing a good number of the town’s old men and mongrels, I came upon something that isn’t exactly a normal fixture in a civilized human being’s daily commute, even if that commute is on foot through a weird little town. It beat out some of the other things I had passed before. Like the day that I had to take a detour to avoid the live donkey standing in the road. Or the day that I almost stepped on a disgustingly smashed bird carcass next to a pile of vomit (outside an auto mechanic). Or even the day that I turned a corner and almost tripped over a metal bowl on the sidewalk filled with pinecones–on fire. No, this was by far the weirdest, most macabre thing I have ever passed so early in the morning. It was a skull. 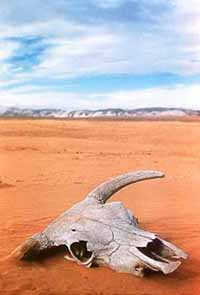 A skull with some form of decaying animal flesh still attached to it in places. Now, it probably wasn’t a cow skull like we have on creepy desert backroads in cartoon America, but it was still a skull and it was one of the first things I saw upon entering La Puerta, which was actually unbelievable. I never really thought that I would actually see that. Anyways, the skull that I saw yesterday was much weirder, because I actually almost stepped on it, so I got a good look at the thing. I honestly have no idea why it was there or what animal it was. It was just sitting in the road, not outside a butcher, not near a particularly wooded area, not near a barn. In fact, it was next to an auto mechanic! God. Anyways, after putting Google to use, it looks like a pig skull, which would make sense since I am in Spain after all. It for sure was not human, which is comforting. Or, if it was human, I should be extremely worried, because there is evidently some kind of alien monster breed of human roaming the hills near my high school. I think pig is probably a more likely answer, but I can’t really say for sure. I didn’t get a picture since I left my camera in Baeza, and when I went back to get a second look in the afternoon, someone had smashed the entire thing to pieces with their car. Smashed. Bone chunks everywhere. Honestly it really grossed me out. BLAH. Anyways, that was the excitement for this week. Luckily I don’t have to go to work next week AT ALL just because I told them I am going on vacation, so I am robbing myself of the opportunity to one up my disgusting experience for the week. BYE, LA PUERTA! See you in a week and a half!!!!! Here is a video from 2007 that keeps me on my toes since I live about three houses from the river and you have to take a step DOWN from the sidewalk to get into my apartment. So this is one of the weirder parts of my town: El Barco. It means “the boat” and it’s this weird thing in the river that is literally just a giant fake boat. 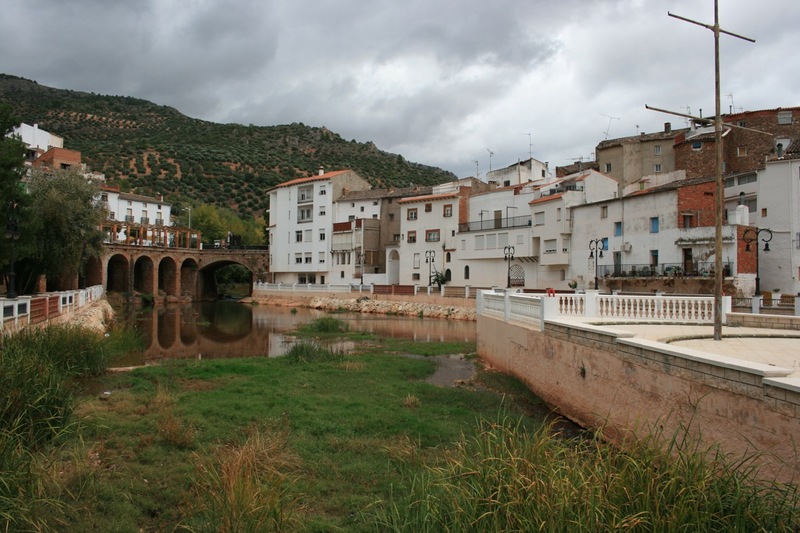 The river really separates the older original town from the newer development along the main road, so El Barco is a great place to get a good view of the old town creeping up the hill from the river bank. View of the old town from "El Barco"
But other than that, that’s pretty much all it’s there for? I can’t figure out why they would have built it at all. I asked my class about it, about why it was there, and they just kind of stared at me, like I was asking a dumb question. I never got an answer. The first mast (there are three fake, sail-less masts) has snapped near its base and tumbled down into the river, where it’s been left for who knows how long. There is also a set of metal cables stretching from the bow up to the bridge that you can see in the picture. I don’t know what it’s there for, but I can only hope they are using it for tin can telephones. The newer part of town is both more boring and less boring than the old part and the boat. I attribute this to its ugliness and the fact that it also has pretty much all of the town’s grocery stores, clothing stores, banks, restaurants, and bars contained in it. It’s pretty much just a road that goes for about 1.25 miles, and I have to walk the entire length of it about four times a day to get to work and back. Its has also been in the low 40s and/or raining the last few weeks, so my “commute” has been extra fun. La Puerta is getting better and better every day, especially now that I have my transportation figured out and have gotten my living arrangement under control. I also fixed my oven and made friends with the librarian, so I can now cook food AND use the internet/read books for free, which is really working well for me. I wish I had more updates on the town, but that is as thrilling as it gets. You can pretty much see the entire town in those three photos above (kidding…kinda), but I am going to work on my exploring skills next week when I go back. The much awaited La Puerta. Where do I begin? Well, let’s begin with its size and location, since that is what makes it….remarkable? Remarkable is not quite the word. Anyways, it’s small. It’s small and farrrr away. It took an hour and 40 minutes on the bus to get to La Puerta from Úbeda, which is already out in the middle of nowhere. The bus ride was uneventful, but it was fantastic to see all the towns that I had only madly researched online until then. They all looked the same, they all looked kind of gross (sorry, towns). 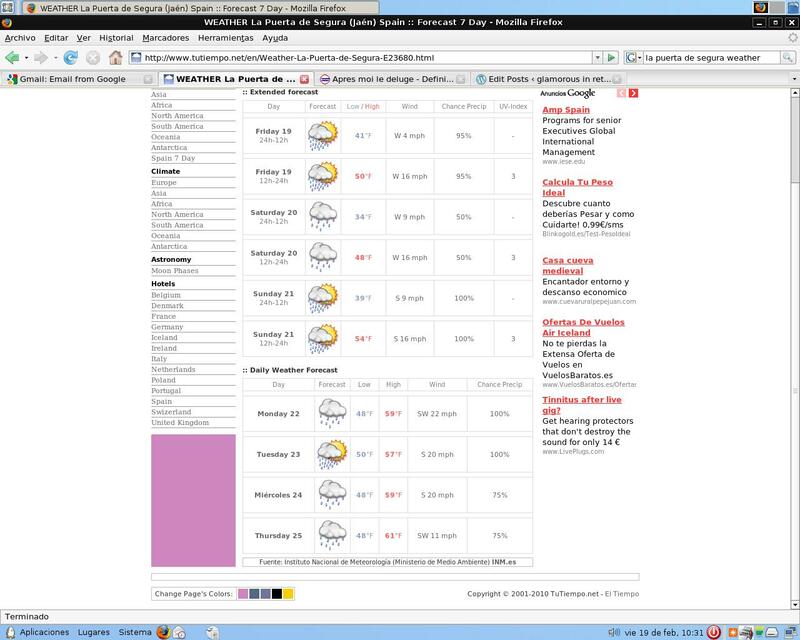 When we got to La Puerta, it was, yes, RAINING. Again. My gafe status reared its ugly head again. I still hadn’t learned the meaning of that word since it hadn’t really become an issue yet. I will explain later. Salvador, my coordinator at the secondary school, picked me up from the bus stop, which was actually just an unmarked street corner in front of the local ferreteria (hardware store, though on my first trip to Spain I was really hoping that it was a ferret store and I think of that every time I see one. They have a Pajararia (bird store) in La Puerta, so a ferret store wouldn’t be too much of a stretch). Anyways, Salvador picked me up and brought me to his house where I was to stay until I figured out my living situation. 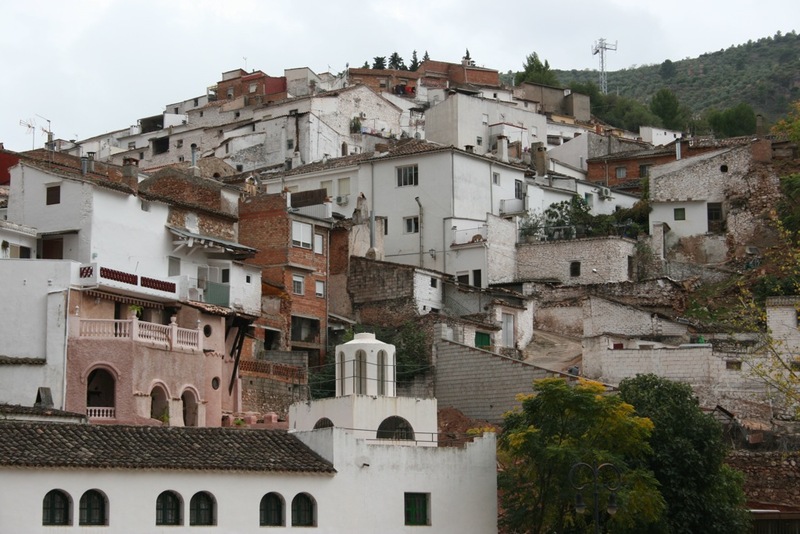 He showed me around the town, which was rainy, hot, and gross, and pretty much consisted of one street (c/ Andalucía), with about a block of houses extending off each side of the road for the entire mile or so of its length. It starts with a Cespa gas station that is filled with old Land Rover Defenders and ends with a bocce ball court filled with old Spanish men that absolutely stared their eyes out when we walked by. Salvador said it was because they had never seen either of us before and they probably couldn’t figure out why we were there. Smeared up on the hill overlooking c/ Andalucía and the bocce ball court is the “old town” which is mainly populated by toothless old people who spend their mornings sitting on benches or folding chairs on the sidewalk and their afternoons toting bags of equally old-looking groceries up the hill to their houses, which look like they are made out of mud and covered in white paint. I think they actually are made out of mud and covered in white paint. One day I saw a lady just touching up the paint job on her white house with a big gloppy bucket of paint. She was like 300 years old and still painting. Anyways, I think this arrangement is pretty cruel, not only because these old people are living in painted mud huts, but also because these painted mud huts are stuck on the side of a hill that was difficult for me and Salvador to climb up, and Salvador is training for a marathon. I think I understand why they sit on benches all day now, because I would need a rest too if I knew I needed to carry multiple bags of smelly old groceries up that hill later in the day. While up in the “old town,” we also saw a troubling looking man with no teeth, some more old ladies sewing on their front porches, and a medium-sized boy with a large-sized gun. They all stared at us as long as they possibly could since we obviously did not belong in this part of the town, or in the town at all. The boy with the gun followed us for more time than I was comfortable with, until he got close enough to us for me to realize that it was only a pellet gun. Still, I was hoping to not get shot on my first day in town by a bullet, pellet, or anything else, so I was rather pleased when he disappeared. Salvador told me that La Puerta was an ugly town and that his town in Sevilla province (Cazaya) was better (which I don’t doubt for a second), and that he joked with his friends that La Puerta was the “end of the earth.” I think he then realized that it would be better for him if I didn’t run screaming from the town on the very first day I was there, so he started to tell me that it really was a rather nice town, not like one of those really terrible towns where they had goats and animals running all over the place. Then we walked down to the river where random horses were just walking around all over. Pooing in the water, walking up the hill, chilling near some stairs, whatever. So the town doesn’t have goats in the streets, but it does have horses in the river. It also has a healthy population of stray dogs and cats, 96% of which are missing half of their tail. Salvador says they are allowed to wander because everyone knows whose dog is whose. Evidently they aren’t strays, the town is just so small that they don’t have an animal control equivalent, and I guess no one cares about their dogs because they are mostly really ugly so no one wants to steal them. There is one cute puppy who always sits in the same place in the street and I see him on my daily walk to school, but the others are nasty. One particularly ugly one with short legs and snaggleteeth roams the street near the bus stop and yesterday I saw it attack some old lady’s equally ugly dog with similar snaggleteeth that she was walking on a leash. There is also a pack of wild cats that lives outside the high school but they are all really cute and at least appear civilized (until you see their half-chopped-off tails). I am too afraid to ever go near them though, because even cute cats are generally mean little jerks, and I have no interest in getting scratches and rabies. There is also some kind of shack posing as a barn in the same location that houses a number of very noisy roosters that crow in the morning, just like a real-life middle of nowhere town should have. The barn smells very terrible, and I suspect there are other creatures living in there, but I am way too scared to peek through the holes in the door to find out what kind of horrible smelly silent beast is sharing the barn shack with the roosters. Generally though, there are less animals than I suspected. The bats, however, are ALL OVER THE PLACE as promised, and you can hear them at night. In Baeza, I have to keep my window closed because I am scared a bat is going to come in and fall on my bed, and you can hear them squeaking outside the window all night long. They look cute from afar, and I actually think they add to the Renaissance atmosphere there, but still, THEY ARE BATS so I don’t want them accidentally falling into my bedroom. But anyways, in La Puerta, there are bats and stray animals and like three roosters and three river horses, and then JUST OLIVES. Olives as far as the eye can see, and then beyond what your eyes can see, more olives. I don’t even know how to describe it except to say that I have never seen so many of one thing in my entire life. They are everywhere. You’d think they’d like some variety in their crops, but evidently not. 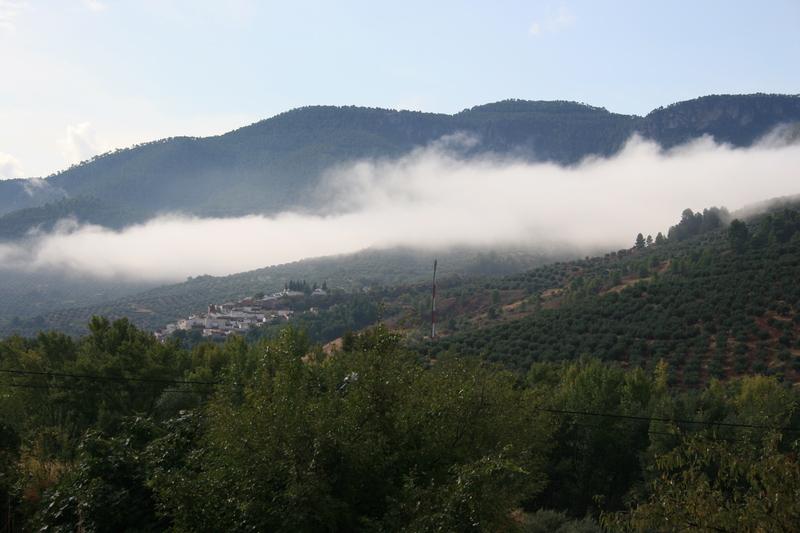 Jaén didn’t get to be the self-proclaimed “capital mundial de aceite” by letting their farmers grow a few nasty fruits or vegetables. It’s olives or bust here. There are also olive oil factories about every ten kilometers throughout the province. Since I’m always in a bus with closed windows and I don’t have a sense of smell anyways (and the air in La Puerta always smells like a rather lovely campfire for some reason), I can’t actually tell if the air here in general smells like olives, but it would make sense. I actually don’t even know what olives smell like. One of the auxiliaries that I met in Jaén told me that during harvest time, which is coming up in November/December, the province is overwhelmed with migrant workers looking for field work, and the streets are filled with the ones who weren’t successful in their search, or who weren’t able to find a place to stay here. And when the trees bloom in the spring and release their pollen or whatever it is they do, people all over Jaén wear facemasks so they can breath without dying. I guess if you have allergies and can’t handle the pollen, you can go to your doctor and they will prescribe you a week’s vacation at the beach for your recovery. Oh, Spain. I have my fingers crossed for an allergic reaction, but with my luck, I’m sure I won’t need to put a lot of effort into making that happen. I’m currently battling my second cold of the trip, and it’s only been 40 days. I’m hoping it’s not swine flu which everyone seems to have here, or at least everyone here thinks they have swine flu. But back to La Puerta: Week one was rough for obvious reasons, and because the bus that I was supposed to catch to get the hell out of there decided to arrive at the bus stop and depart from the bus stop about ten minutes early, I was trapped there for an extra day that I really wasn’t looking forward to. That straw broke the camel’s back and resulted in a few tears. But the next morning, after walking very, very far in the dark with lots of bats around, I was on a bus out of there for the weekend. The next two weeks were better. Work is easy and fun and short (12 hours per week), and everyone is really helpful with me and my Spanish, which needs a little work. The benefits of the town being super small are also starting to show. The students and teachers at the two schools I work at make up about a fifth of the town’s population, so I see them all over the place, which makes it easy to feel at home and to get free rides to school! And I found an apartment! I am living with a 29 year-old kindergarten teacher named Silvia who spends the weekends with her husband and one year old baby in Úbeda. She only speaks Spanish, and she is a TALKER, so it’s been really good for my Spanish. She also has the patience of a kindergarten teacher when it comes to attempting to understand me, which comes in handy…a lot. I’ll have plenty more to say about La Puerta in the future, so I’ll save the rest of my stories—like my first time eating CONGEALED BLOOD (seriously, gross) and my experience with a flat tire on a dirt road in the middle of the night and the middle of an olive field—for later. ‘ta luego, as they say. Or at least as they say here.